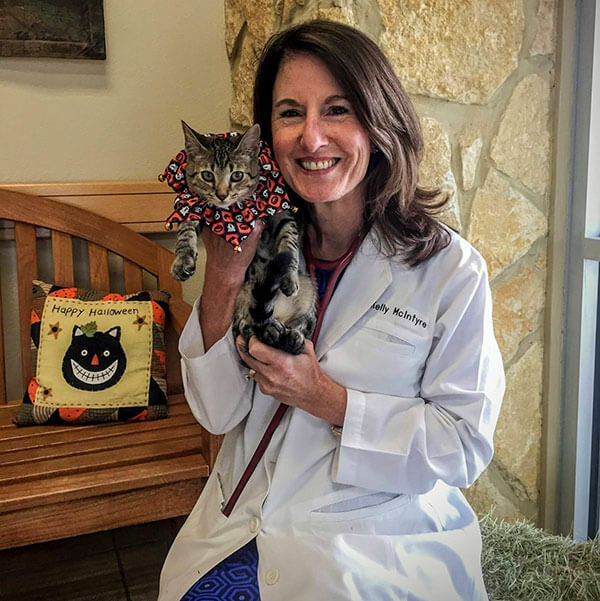 Dr. Kelly McIntyre is the owner and founder of Crossroads Animal Clinic. Crossroads Animal Clinic was opened in November of 1994 in a strip center at Highway 6 and FM 529. We moved into our award winning free standing hospital in November of 2004. It was the culmination of my lifelong dream to offer a state of the art hospital to the community where our clients and their pets can feel welcomed and comfortable. I have been serving our community and their furry friends for over 30 years. I am honored to be able to love and guide 3 generations of pet owners. I have a number of families where I take care of all 3 generations. This is incredibly rewarding and fulfilling. I knew that I wanted to become a veterinarian at a very young age. It was the perfect profession that combined my love of animals and science. I believe the saying, "If you love what you do, you never have to work a day in your life." I love what I do each and every day. I am passionate about providing the best care for your pets and supporting and educating pet owners. From the very first visit of our excited and proud pet owners cradling their brand new puppy or kitten, to our grieving pet owners making the difficult and heartbreaking decision to help their beloved companion cross the Rainbow Bridge. There is no greater joy and no greater sadness. I have been happily married for over 30 years. My husband, Butch Miller, is the practice manager, maintenance man and general all-around problem solver. I couldn't do it without him. We have 3 amazing children. Nathan is 25, newly married and working for Boston Scientific, Grace is 21 and in her senior year at Texas A&M University and Jacob, our baby, is 17 and enjoying his high school years. They complete my life. I thank God each and every day for blessing me with my family and the opportunity to help people and their pets. 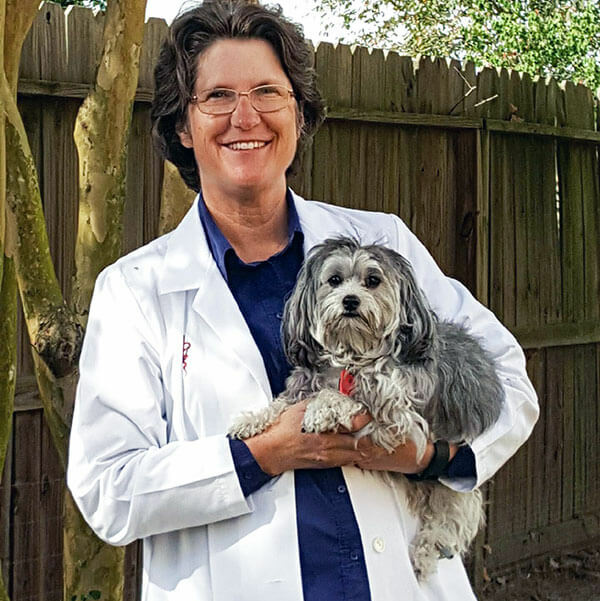 Dr. Julie Moreland McInnis is a 1985 graduate of the Texas A&M University College of Veterinary Medicine. She feels very blessed to have the privilege of being a veterinarian. Practice is just as much a joy today as the day she graduated. Dr. McInnis has had the pleasure of practicing at Crossroads Animal Clinic since 1999. Dr. McIntyre and Dr. McInnis were classmates in vet school and they love practicing together. She is most proud of her family, Noel, her devoted husband of 31 years and her 3 daughters. She also shares her life with a lovable, adorable bundle of fur named Pixie and a parakeet named Dew Baby. In her spare time, Dr. McInnis enjoys the Girl Scout experience with all of her girls. She has been involved in Katy Taylor's marching band. Dr. McInnis has been a dedicated "band mom" for many years. Her favorite place to visit is Alaska. She and her family have been there many times. She looks forward to getting to know your special pet and your family.